Location: Hampton Court station, next to coffee bay on main concourse. 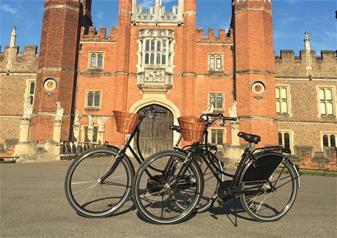 Your scenic bike tour will begin at Hampton Court Palace train station where you will meet your expert guide before heading to the grounds of the beautiful royal palace. It is here where your exciting eight mile adventure really starts! During your bike tour, you’ll explore many of the country’s finest locations. You’ll get to take in breathtaking views of Hampton Court Palace, the previous home to the formidable Tudor King – Henry VIII and venture through the delightful royal Bushy Park where you can discover where Eisenhower had his WWII base. It is here that you will have the opportunity to see deer that are the direct descendents of the deer bred by Henry VIII! You’ll also get to explore Home Park and take a break at a local pub for a drink (not included) before continuing your journey to the end of the Long Water where you will have the opportunity to see views of Sir Christopher Wren’s famous baroque design. Throughout your tour, you will be led by an expert guide who will unravel the rich history of the idyllic locations. Once you’re at Hampton Court Palace’s riverside entrance, you’ll discover its iconic place in British history that dates back over 500 years. The tour ends close to the entrance so you can choose to go into the palace grounds and explore or head over to the nearby train station. This colourful, fun cycle tour will bring to life the beautiful Hampton Court Palace and its surroundings – it’s not to be missed!